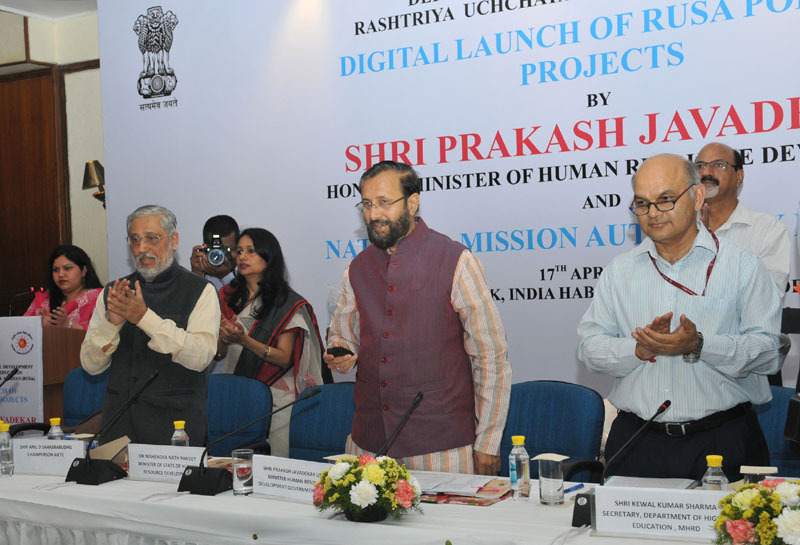 The Union Minister for Human Resource Development, Shri Prakash Javadekar launching the unique portal and mobile app of Rashtriya Uchchatar Shiksha Abhiyan (RUSA), a body under the aegis of the Ministry of Human Resource Development, in New Delhi on April 17, 2017. The Secretary, Department of Higher Education, Shri Kewal Kumar Sharma is also seen. New Delhi: Union Minister of Human Resource Development Shri Prakash Javadekar today launched the unique portal and mobile app of Rashtriya Uchchatar Shiksha Abhiyan (RUSA), a body under the aegis of the Ministry of Human Resource Development here in New Delhi. Speaking on the occasion Shri Javadekar said “Our Government’s first priority is to improve the quality of primary as well as higher education. Unless we improve the quality of education we will not be able to create capable people and good citizen and therefore improvement of quality is the thrust for all our efforts in the educational fields. 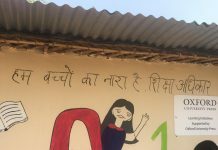 Today this is a unique event as well as experiment wherein we have inaugurated 17 facilities created under Rashtriya Ucchatat Shiksha Abiyan (RUSA) in one go in 14 states”. He said that Centre and State Government will be deliberating and discussing upon the modalities for bringing improvement further. Under the concept of RUSA the quality of education can go up by improving the research labs infrastructure and creating smart class rooms and various other programmes by which the quality enhancement and value addition to the students happen, Shri Javadekar added. The Minister said ‘RUSA is a success and during the last three years Modi Government has increased the expenditure to the tune of Rs. 2800 crore for this. He said we have created infrastructure in many universities, colleges and model colleges. We have also provided Rs. 1300 crore in this year’s budget. Since this is happening for the first time, we are very hopeful and excited and I am sure this scheme will be a great success towards enhancement of higher education’ he added. Shri Javadekar also released the Booklet “Digital Launch of Projects; Rashtriya Uchchatar Shiksha Abhiyan (RUSA)” on this occasion. Various State Education Ministers, Secretaries, RUSA Nodal officers from many states were also present during the programme. Up-gradation of Existing degree colleges to Model Degree Colleges: Academic (Commerce) Block in Dera Natung Government College, Itanagar (Arunachal Pradesh); Infrastructure Grants to the University: Computer Lab at Maharshi Dayanand University, Rohtak (Haryana); New Colleges (Professional): Rajiv Gandhi Government Engineering College, Kangra (Himachal Pradesh); Creation of Cluster Universities in Jammu and Srinagar (District), Jammu and Kashmir ( J&K ); Equity Initiatives: Digital Language Laboratory in Ghatsila College, Ghatsila, Kolhan University (Jharkhand); Infrastructure Grants to Universities: Solar Panelling System in Sree Sankaracharya University of Sanskrit, Kalady, Ernakulam (Kerala); Infrastructure Grants to University: Academic Block, Government Rani Durgawati College, Mandla (Madhya Pradesh); Research, Innovation and Quality Improvement in Shivaji University, Kolhapur & Savitribai Phule Pune University, Pune (Maharashtra); Infrastructure Grants to Colleges: Renovation of IT/Bioinformatics Centre, Laboratories in Biotechnology, Food Technology, Chemistry, Biological Science, Home Science and Geology in S. Kula Women’s College, Kongkhampat, Nambol (Manipur); Infrastructure Grants to Colleges: New building for M.Ed. Classrooms, Institute of Advanced Study in Education, Republic Veng, Aizwal (Mizoram); Infrastructure Grants to University: Smart Classrooms and Moot Court Room, Mohan Lal Sukhadia University, Udaipur (Rajasthan); Preparatory Grants: Management Information Systems (MIS) in all Government College of Sikkim; Infrastructure Grants to Universities: Women Hostel at Bharathiar University, Coimbatore (Tamil Nadu); New Model Degree College (MDC) at Kalwakurthy, Nagarkurnool (District), Telangana and Infrastructure Grants to University: Yogic Science Laboratory in Uttarakhand Sanskrit University, Haridwar (Uttarakhand). The detailed information regarding the projects can be had from the RUSA website rusa.nic.in. Shri Javadekar also launched on this occasion the Fund and Reform Tracker for this centrally sponsored scheme. The mobile application will ensure that all projects under RUSA are tracked 24×7. Earlier in his welcome address Shri Kewal Kumar Sharma, Secretary Higher Education expressed the hope that proper and timely implementation of project will usher in transformative Reforms in State Education system.